What Drinks Contain Vitamin C? Vitamin C is a an antioxidant vitamin that helps grow and repair tissue throughout your body, counter free-radicals which cause cell damage and fight the negative effects of toxins. Vitamin C is not a naturally occurring supplement, nor is it stored in the body, so you must continually replenish it through consumption, via food or supplements. All fruits and vegetables contain vitamin C, according to The National Institutes of Health, but some foods contain more than others. 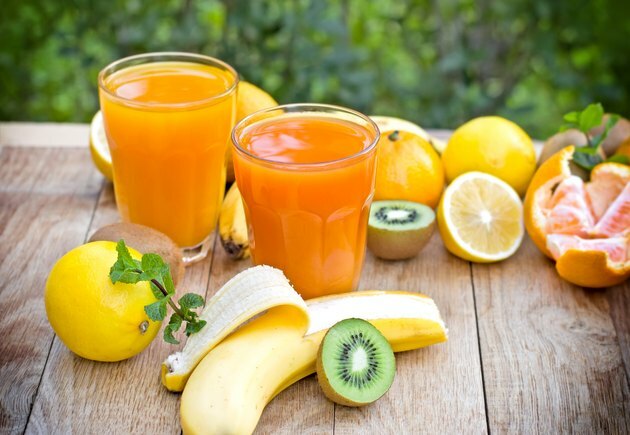 One way to get vitamin C into your diet is by drinking vegetable juice. Whether you drink commercial drinks, which offer a blend of vegetables, or juice your own individual vegetable or combination of vegetables, you will be able to concentrate your vitamin intake more than by eating these same vegetables. When you eat a 3 oz. carrot, much of what you are eating is dietary fiber. When you juice a carrot, the fiber is removed and you get more vitamin C in the same 3 oz. serving. Red and green peppers are rich sources of vitamin C, with a half-cup serving providing 100 percent or more of your recommended daily allowance, according to the Office of Dietary Supplements. If juiced broccoli and Brussels sprouts, two other rich sources of vitamin C, don't appeal to you, tomatoes are another good source of this nutrient and form the base of a numerous vegetable juices. One of the most popular fruit juices, orange juice is a rich source of vitamin C. A half cup of orange juice provides more than 100 percent of your RDA. Many commercial providers of orange juice offer different varieties, with some adding calcium for added health benefits. Others may call themselves orange drinks, but contain a high amount of water, in addition to sweeteners, coloring and other additives. Read the nutrition label of any orange drink to ensure you get the amount of vitamin C you are seeking in a fruit drink. Kiwi and grapefruit are two other fruits that rival the orange's vitamin C content. A medium kiwi or grapefruit contain more than 100 percent of your RDA for vitamin C. Grapefruit juice is another popular fruit drink found commercially in many grocery stores and restaurants. Like orange drinks, grapefruit drinks may be watered down and contain additives, so you'll want to read nutrition labels on these products. Some drinks mix fruits, such as various kiwi lemonades and the popular mix of ruby red grapefruit and tangerine, another good source of vitamin C. Cantaloupe is another excellent source of vitamin C, with one cup providing almost 100 percent of your RDA.